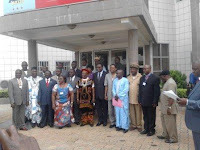 Delegates nationwide are meeting at the Azam Hotel in Bamenda today, June 30, 2012 to take stock of 2011 activities and at the same time project for 2012. Addressing delegates Vincet Nji Ndumu, Government Delegate to the Bamenda City Council said CamCCUL has been a veritable partner in development. He also applauded CamCCUL leadership for the continuous fight against poverty and its effort in transforming the city of Bamenda. On his part, the President of CamCCUL, Musa Shey Nfor told delegates and partners that he was so delighted and overwhelmed with the massive turn out which is a true testimony of their attachment to the credit union movement in Cameroon. He said the 44th Annual General Meeting is just taking place six months after delegates met in Buea to review and validate 2011 activities. According to Musa Shey Nfor, credit union activities are different from the classical banking system. He expressed gratitude to delegates for visiting the construction project and lamented that though CamCCUL is apolitical some politicians have started interfering into CamCCUL activities. He also pleaded with the Head of state, President Paul Biya to look into the tax problems affecting category one Micro finances in Cameroon. These taxes he said “are heavily draining the resource that would have been used by members”. 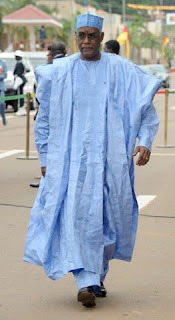 He also added that CamCCUL will be grateful if Government could intervene in the insecurity that plaguing CamCCUL. Musa Shey Nfor cited the case of the Kumba and Bamenda Chapters where there is an urgent need for special security measures. It is expected that at the end of the meeting, CamCCUL delegates would come out with a powerful communiqué to sanction recalcitrant move by some overzealous members painting the credit unions black. The Senior Divisional Officer for Mezam has banned the movement of pigs in and out of Mezam Division in the North West Region of Cameroon. The Prefectoral Order banning the movement of pigs came after thousands of pigs are reported to have died within the past week. According to sources to link to the Regional Delegation of livestock, the illness has not yet been identified. Moreso, the services of Livestock have proven helpless to the outbreak. Yet, sources hinted that samples of dead animals have channeled to the Centre Pasteur in Yaounde for examination. It is feared that if ravaging illness is not stopped, the pig sector in Mezam will be completely wiped off in the next days. At the beginning many farmers thought it was swine erysipelas, but the syndromes are completely different. 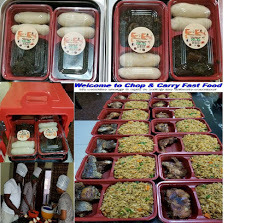 Farmers complained that the pig starts by losing appetite and then dies within the next hours. The lack of pig slaughter houses and storage facilities have further complicated things for the farmers. Even though a vaccination campaign was recently launched in the Northwest, farmers have complained a variation in prices. “Presently the situation is pathetic because if the illness is not identified, I fear the sector will be wiped off” says Atomba Titus of the North West Pig Cooperative. On the other hand, some farmers say it is the first time they are seeing such a ravaging disease. President Biya has signed a decree today, June 29, 2012 dismissing the Rector of Yaounde II University-Soa, Jean Tabi Manga, the Rector of Douala University, Bruno Bekolo Ebe and the Vice Chancellor of Buea University, Vincent Titanji. 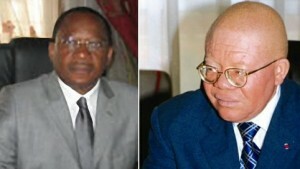 Bouba Oumarou formerly Rector of Yaounde I replaces Tabi Manga at Yaounde II while Dieudonne Oyono replaces Bruno Bekolo. On the other hand, Madame Nalova Lyonga Pauline Egbe takes over from Vincent Titaji as the Vice Chancellor of the University of Buea. Meanwhile Maurice Aurélien Sosso formerly in the Ministry of Higher Education replaces Dieudonne Oyono at Yaounde I who has been moved to Yaounde II. Public opinion however holds that Tabi Manga and Bruno Bekolo may face the ax of the Supreme State Control on alleged mismanagement charges. This, observers say has contributed to their sacking. Notwithstanding, Vincent Titanji was already due retirement and he is expected to retire from active administration. Ni John Fru Ndi, the National Chairman of the leading opposition in Cameroon has declared that the civil society has to take the chance as the Biya regime is collapsing to resolve the problems of Cameroon. SDF National Chairman made the statement in an interview published today, June 28, 2012 by a Bamenda based newspaper (The Independent Observer). 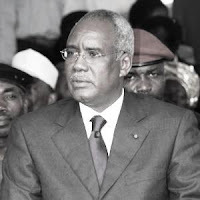 According to Ni John Fru Ndi, Marafa's letters and the recent arrests and indictment of some government officials are glaring examples of a confused regime that functions without conscience. "If Mr. Biya were true to himself and had a conscience and with all the revelations Marafa has made, he would have resigned to make way for justice to take it course". Yet, Fru Ndi after reading Marafa's letters, he observed that he (Marafa) was "selling after the market". He also observed that he (Marafa) had "Presidential ambitions and Mr. Biya is jailing him for that". Accordingly, Fru Ndi also hammered that Mr. Biya does not like challenge and "That is why we supported the idea of our lawyers defending Marafa so that he could have a fair trial. On his inability to address burning issues like he used to do in the early 90s, Ni John Fru Ndi said, at his age, he is no more the person that should be everywhere. "The Civil Society should take the lead and effect the necessary change in Cameroon". Yet political pundits are of the opinion that Ni John Fru indirectly acknowledged that politicians have failed and Cameroonians should look forth at the civil society. Another School of thought holds that the Biya regime is gaining grounds with its major realisation programme that is gradually transforming the country into a vast construction site. Over 1000 okada riders blocked the City Chemist Round About today, June 27, 2012 to express their grievances. The okada riders have been angered by the fact that the Council police in Bamenda are more corrupt than the regular forces of law and order. They say the Government Delegate to the Bamenda City Council, Vincent Nji Ndumu must go. “No Council Police” they chanted. It is even alleged that the “Hooligans” as they are commonly referred to also shattered the screens of some vehicles at the City Council premises before moving to City Chemist Roundabout where they blocked traffic for over an hour. Some of the riders argued that it is uncalled for that the City Council Police is asking them driving licenses as well as other documents that they cannot afford for. “We cannot pay 50.000 FCFA for a driving license and the SDO is saying we should not carry more than one person on the bike”. Some of them even complained that even if they pay the money, it might end up in private pockets. They also observed that if the public treasury has been pocketed by few individuals, they would have had better jobs. “We want the state to recover all the money stolen by these state gangsters, many whom are still moving in our streets before we too can pay more money to the treasury” one of them hammered. 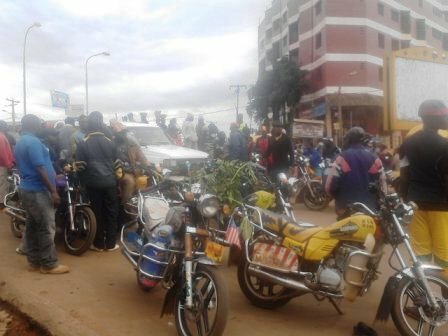 Those who defied the call for the strike brutalized by their colleagues; however, there is relative calm at City Chemist Roundabout as the over 1000 okada riders have moved to meet the Senior Divisional Officer for Mezam. However, it is alleged that there are over 5000 okada riders in Bamenda, out of this number approximately 4000 are in the without driver’s licenses. 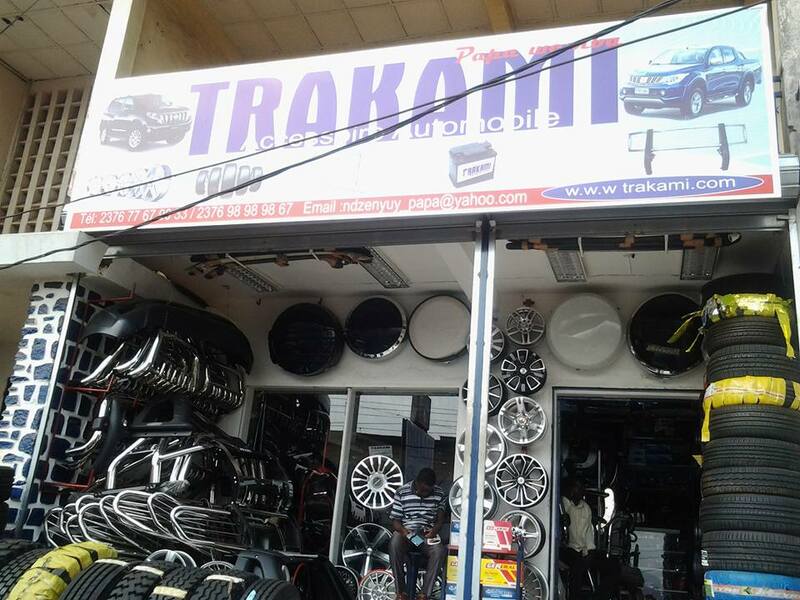 Whereas a day ago, the same okada riders held a meeting with the SDO for Mezam and agreed that they must all comply to the Prime Ministerial text of December 2010 regulating the motorbike sector especially commercial motorbike businesses. I am writing to inform the Cameroon Public that l am a political prisoner of the head of States. I am being treated worse than my cows. I rear cattle but the cows get moved to a shade when it is raining. I was compelled to confer with my lawyer in the rain on Monday, June 18 after being barred from conferring with my defence counsel for more than two weeks. I was finally allowed to meet with my lawyers, but our meeting took place in the rain. My lead defence counsel, Mr. Ndiva Kofele Kale, said Cameroon is violating the United Nations standards for conditions of detention and the treatment given me confirms the fact that I am a political and not an economic criminal. My lawyer had arrived at about 3 pm while I was chatting with Mr Fotso. Mr Fotso moved out of my cell into the corridor to allow me to confer with my lawyer but the Gendarmerie Lieutenant ordered us out into the courtyard, to converse under the rain for about half an hour. I reminded the gendarme guard - an Adjutant Chef that l am a political prisoner. I later confront the Adjutant Chef who said he was respecting the instructions of his superior officer, a Lieutenant. I informed the colonel in charge that l will be instructing my lawyers to write a letter addressed to the Minister of Justice, the Head of state and United Nations regarding the inhumane treatment that l am being subjected to sit in the rain by the authorities. The Colonel pleaded with me that those were not his instructions but the instructions of the Lieutenant working under him, the Colonel said he had left before my defence counsels had walk in and he did apologizes for what had happened and promised that he will make sure that it doesn’t happen again. 2.I should be served with a charge sheet detailing the offences l am accused of committing. The interrogation will take place in the presence of my lawyers. The State carries the burden of proving me guilt is beyond a reasonable doubt. I have the right for a prompt notice of the nature of the charges against me and my right to be tried should be without undue delay. This is a plot to eliminate me from the political stage by any means necessary. Je vous écris pour informer le Public du Cameroun que l suis un prisonnier politique de la tête des États. Je suis actuellement traitée pire que mes vaches. J'arrière bovins mais les vaches se déplacés à une nuance quand il pleut. J'ai été contraint de conférer avec mon avocat sous la pluie le lundi 18 juin après être empêchés de conférer avec mon avocat de la défense pendant plus de ...deux semaines. J'étais enfin a...llowed de rencontrer mes avocats, mais notre rencontre s'est déroulée sous la pluie. Mon avocat de la défense de plomb, m. Ndiva Kofele Kale, dit Cameroun viole les normes de l'Organisation des Nations Unies pour les conditions de détention et le traitement me confirme le fait que je ne suis pas un criminel économique et politique. Mon avocat était arrivé à propos de 15, alors que j'étais sur le chat avec M. Fotso. M. Fotso a quitté ma cellule dans le couloir pour me permettre de conférer avec mon avocat, mais le Lieutenant de Gendarmerie nous a ordonné dans la Cour, de converser sous la pluie pendant environ une demi-heure. J'ai rappelé à la garde de gendarme - un Adjudant Chef que l suis un prisonnier politique. Plus tard, j'ai affronter Adjudant Chef qui a dit qu'il a respecter les instructions de son supérieur, le Lieutenant. J'ai informé le colonel en charge que l soit disant mes avocats pour écrire une lettre adressée à la ministre de la Justice, le chef de l'Etat et des Nations Unies concernant le traitement inhumain que l suis soumise pour s'asseoir sous la pluie par les autorités. Le Colonel a plaidé avec moi que ceux qui n'étaient pas ses instructions, mais les instructions du Lieutenant travaillant sous sa direction, le Colonel a dit qu'il eut quitté avant mon conseille a marcher dans la défense et il a fait s'excuse pour ce qui était arrivé et a promis qu'il fera en sorte que cela ne se reproduise plus. 2.I doit être servie avec un acte d'accusation détaillant que le infractions l suis accusé d'avoir commis. L'interrogatoire aura lieu en présence de mon avocat. La porte de l'État le fardeau de prouver la culpabilité m'est hors de tout doute raisonnable. J'ai le droit pour un avis rapide de la nature des accusations portées contre moi et de mon droit d'être jugé doit être sans retard indu. Il s'agit d'un complot visant à m'éliminer de la scène politique par tous les moyens nécessaires. The Ministry of Communication headed by Issa Tchiroma has always ignited surprises. In fact those who took the pains to read the communique from that Ministry on Government financial aid to the private media were taken aback. It is scandalous that on the list of beneficiaries were the names of some foreign public media houses. Cameroonians have been wondering how the British Broadcasting Corporation-BBC and France Television which are public media houses could benefit from government support to the private media houses in Cameroon. The controversial list published by Issa Tchiroma also mentioned the Japan Broadcasting Corporation and the Brazilian Film Production firm as beneficiaries. "Whereas there are media organs in Cameroon that have not been given the meager support", many have been questioning. The rationality and justification of this act continue to create sensation as well as anger many young media houses in Cameroon. Public opinion however holds that MINCOM has taken up a challenge of public image cleansing by using taxpayers money unjustly. Many continue to look at the support to foreign media houses as another form of mismanagement with the complicity of the International Community. North West Governor Lele Lafrique Tchoffo Deben Adolph has called on the population of Donga Mantung Division to support President Biya in his fight against embezzlers of state funds. In his key note address on June 20, 2012, Governor Lele Lafrique told the population that everybody is equal before the law and no one should think that he or she can manipulate public sympathy after being napped in the dragnet of the fight against corruption. “We cannot say we love our fatherland by embezzling state funds and disrespecting state institutions” he told the crowd. “Either we move on to have hope or shy to remain poor” he reiterated his message. Without mentioning any names, there was no doubt that the message had as target the recent revelations of Maraleaks (Marafa open letters). He reminded the people of Donga Mantung Division that embezzlers had consumed huge sums of money and it had retarded development reasons why President Biya launched a fearless war against the white-collar thieves. “Those who thought we the untouchable” he said were napped for embezzling state funds. In his clarion call, he urged the population to support President and shun away from those who want to mislead public opinion on the issue. “Let’s protect our country” he added. To corroborate his speech, the population was also entreated to a presentation on corruption. It should be noted that on June 19 and 20th, Governor Lele Lafrique visited the border villages of Sabongari in Nwa and Abuenshie in Ako where his key message centered on the fight against corruption and peace. 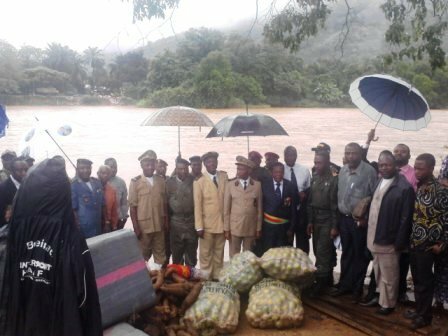 With the fear that Boko Haram may infiltrate into Cameroon through the border villages, North West Governor defied the bad roads and moved to Sabongari and Abuenshie in Nwa and Ako sub Divisions respectively. Governor Lele Lafrique said he was impressed with the calm and the peace that reins between Cameroonians and Nigerians. He also assured the population of the border villages that the government of Cameroon is aware of their problems and will soon provide long lasting solutions to them. At Abueshie he River Donga which separates Cameroon with Nigeria. He also visited the Ako border market and some security services in the area as well as the costume post that is completely abandoned. While in Nkambe he reechoed that the population should collaborate with the forces of law and order to ensure their well-being. He warned against tribalism, intertribal conflicts and others because they hinder meaningful development. He urged traditional rulers and elite to act as guarantors of peace and not to promote unnecessary conflicts that could jeopardize development efforts. “Peace has no price, we need to renounce all criminals because the forces of law and orders need your support to succeed” he told the people of Donga Mantung. He also called on the population to join President Biya in his 3rd generation agricultural development policy to boost meaningful development. He said with the collaboration of the population, Donga Mantung Division will be transformed giving that the Division is blessed with top and soft soil resources (a lot of underground minerals). It should be noted that the old Nkambe Division, now called Donga Mantung Division shares over 150 km long boundary with Nigeria beginning from Yang in Nwa down to Manjarandi in Misaje. As the Mayor of Nkambe puts it “the border is porous and needs the creation of more administrative units to easily protect it”. Created by the old colonial British in 1940, its headquarters was located in Ndu up to 1944 before it was moved to Binka. In 1948, the headquarters was transferred to Nkambe till date. After re-unification in 1961, the Nkambe Division started witnessing some restructuring. In 1963, the sub division was created with a resident Divisional Officer and a council attached to it. This was followed in 1967 with the creation of Mbembe/Misaje with headquarters in Akweto. 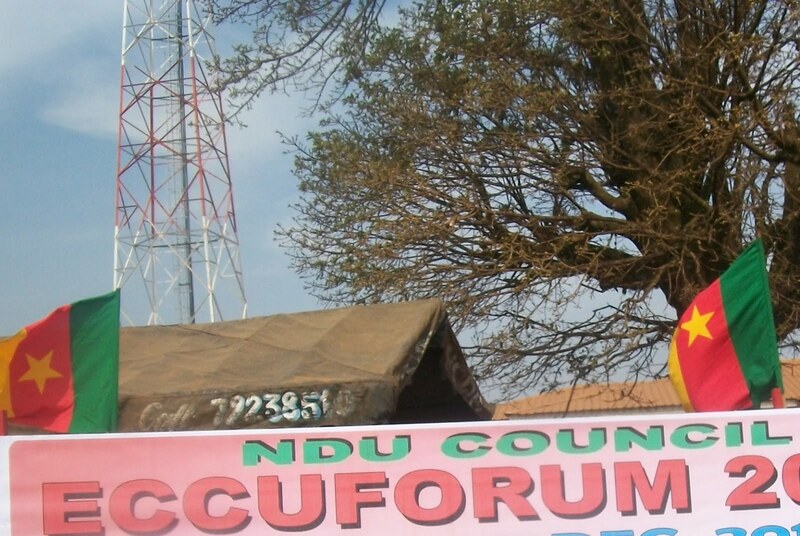 In 1992, the restructuring created the Sub Divisions of Ndu, Nkambe, Ako and Misaje. Nwa, the oldest sub Division in Cameroon could be transformed into a full flesh division with three or four sub divisions. So the five sub divisions of Donga Mantung Division could easily be transformed into full flesh divisions and transformed into a region with headquarters in Nkambe. It is for these reasons that late Hon. SN Tamfu nursed the idea and the vision of the Far North West Region that was supported even the separatists Southern Cameroons activists yet, the government of Cameroon has been reluctant over it. Tension is graduality mounting as it is alleged Misaje Sub Division will be carved out of the Donga Mantung Division to add to Oku, Bum and Noni to create a separate Division. The graduation ceremony of the International University of Bamenda, IUB almost ended in chaos when police stormed the premise of the Mankon Catholic Cathedral Hall where on June 13, 2012. But the promoter of the Bamenda International University Prof. Patrick Fusi said " I applied for an authorization to hold this graduation ceremony and was duly given an authorization by the Divisional Officer for Bamenda II. So what is the problem? What type of government do we have in this country, Cameroon?". The Eye was hinted that police stormed the ceremonial ground because the application did not indicated the presence of first class fons like the fon of Nso and more importantly the presence of some fons of the South Region. We also gathered the Divisional Officer for Bamenda II sneaked into the hall and sat at the back bench monitoring and communicating police officials. It should be noted that the presence of the police scared off fons of the South as well as the Fon of Nso who also disappeared from the hall as the ceremony came to a halt for over 30 minutes. However, at the end, over 30 graduates went home with their degrees ranging from Bachelor, Masters and PH.Ds. Some of the graduates came as far as IUB Buchi in Nigeria State Campus while a host of others bagged honorary degrees ranging from Doctors and Professors. 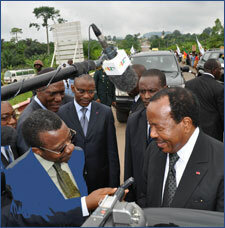 President Paul Biya was in the South Region for an official visit of 48 hours on Saturday, June 16, 2012. A visit during which the Head of State official launched the 730 US dollars hydroelectric project. Before leaving Memve'ele in the locality of Nyabizan ( Ntem Valley) he made some shocking declaration that took Cameroonians aback. On the epistolary activity of one of his former associates arrested as part of Operation Sparrowhawk, President Biya told journalists that Marafa revelation are just simple commentaries. When quizzed by journalists on what some of his former colleagues who were recently arrested and detained in prison have been publishing President Biya said " The judiciary is independent. Allowed it to take it course and see the results, and we shall accept them. On the other hand, I do not comment on the comments". To Paul Biya, Marafa's letters are just commentaries. Yet, public opinion holds that the comments Biya made were still commentaries linked to the Marafa commentaries which observers on the other hand still consider it as a step forward. The national and international media and by extrapolation public opinion is now gripped by what is referred to as the ‘Maraleaks’. The media in Cameroon is upbeat about the Marafa letters that are making headline news, but most importantly is the fact that the regime is equally bent on stifling the publishing of the letters or discrediting the information therein as mere farce. This wish by the regime and the zeal expressed by the public to continuously savour state secrets being put in the market place of ideas by a former state functionary is sending jitters and hot sweat down the spines of many government barons. It is not the letters per se that makes news but what is hidden behind those letters and what may come next. Actually, in journalism like in public writing, the writer is supposed to be able to draw a line between what the public wants to know and what the public needs to know. This is so because the public is always anxious to know much or everything including the functioning of the state, something which is often considered a preserve of a few. And all along, it has been so until Marafa Hamidou Yaya ripped open the Pandora Box and state secrets are in the open. Marafa Hamidou Yaya, former Secretary General at the Presidency, former Minister of State, Minister of Territorial Administration and Decentralization who belonged to the chosen few that were privy to state secrets has decided to become the latest prolific writer in prison, dishing out calculated dozes of state secrets to the admiration of the public and the chagrin of government. When Marafa Hamidou Yaya who was arrested along side former Prime Minister, Chief Ephraim Inoni fired his first salvo by writing an open letter to the Head of State in which he made incriminating revelations about his dealings with the Head of State and the functioning of the state, many ministers started trembling. This was so because many of them who equally had some dealings with Marafa when he was in government did not know how far he could go in his letters. AS Secretary General at the Presidency and former Minister of State, Minister of Territorial Administration, Marafa had a lot of influence and connections with a network that the regime does not clearly master. Many of those serving in government and in many duty posts in the administration are Marafa’s men. What they have in store nobody knows reason the regime is trembling because if they are still loyal to Marafa, they can destabilize the state. And while the regime was yet to digest the first letter and look for means to counter it, Marafa pumped another letter that was considered very disastrous to the regime as it picked holes in the promulgated electoral code. This is where Marafa has drawn sympathy from the opposition political parties that boycotted the voting of the promulgated electoral code. Equally, this can compromise funding of the electoral process by foreign donors not to talk of the international recognition of any election emanating from such an electoral code. These are issues the regime does not like and Marafa knows that, reason he is only targeting issues the government has never wanted to be in the open. People are always afraid of the unknown because they do not know, which direction change can take. Marafa Hamidou Yaya is well known by the regime and its members, yet he remains greatly unknown an unpredictable given his recent activities and gesticulations since the day he was arrested. The issue that is making the regime to tremble is the fact that Marafa was so closed to power for long and has the secret documents and all protocol agreements between Cameroon and other nation states. He can decide to make public this secret dealings and this will greatly discredit the present regime. Like in his first letter, Marafa clearly indicated his closeness with the Head of State, giving away the idea that he was the person managing Cameroon while the Head of State was just a bureaucrat. This does not augur well for the regime. Another issue is that Marafa had longed prepared himself to succeed Biya as per the revelations in his letters. And any person who has such ambitions must have contacted, contracted and confirmed national and foreign assistance. The regime is trembling because it does not know the expanse of Marafa’s influence. That is who is supporting him where, how and to what extend? Members of the regime are trembling because Marafa is alleged to have serious international support which he can rely on to topple the present regime. This thesis is supported by the fact that prior to the 2011 Presidential elections Marafa was cited as a candidate of some foreign countries. The regime actually believed so as per his first letter where he said the Head of State asked the Director of Civil Cabinet to inquire whether he, Marafa was to stand against him the Head of State in the October 2011 Presidential election. Added to this are the revelations Marafa is making. The regime is trembling because Marafa is not only exposing the corrupt nature of the regime in place but is pointing accusing fingers on some government ministers that are still serving, for being responsible for most of the mishaps of Cameroon. This is why some ministers are quick to chastise Marafa in a bid to dissuade him from publishing more state secrets. They are afraid that he might call their names as those who were planning with him the after-Biya succession. Unfortunately, those who are against Marafa’s letters are not providing alternatives to the population that is anxious to know how Cameroon is governed. Equally, the regime is dodging away from the issues raised by Marafa in his letters, thus creating more suspicion in the minds of the public and attracting sympathy for him. For instance the management of petroleum revenue in Cameroon has always remained a state secret. And the regime is afraid that Marafa who was Board chair of the National Hydrocarbon Company, SNH can spill the beans and attract a public disapproval of the underhand methods of the regime and its barons on the management of petroleum revenue. How are people recruited in SNH, how much does petrol contribute to the national budget are questions on the lips of most Cameroonians and Marafa may provide the answers, a thing the regime is afraid of. As regards the Albatross, Marafa has cited the names of the people who are supposed to be held responsible for embezzling the tax payers money meant for the purchase of the presidential aircraft. 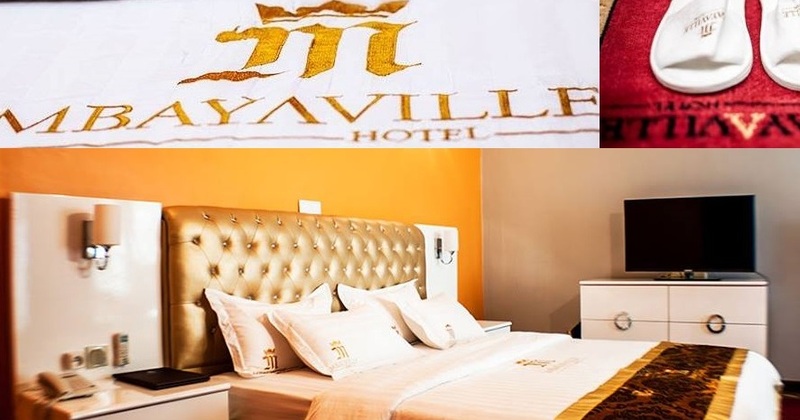 It is not only the revelation citing the names of those involved, including that of the Head of State that is disturbing but the fact that Marafa Hamidou Yaya can block the trial of the Albatross affair by refusing to cooperate with justice as he has started doing. This will be very embarrassing to the regime as many of the accused would have been unjustly detained. In his fourth letter to the Head of State Marafa has indicated how money meant for the compensation of victims of the 1995 Boeing plane crash in Douala has been embezzled by members of government. This fourth letter has attracted some sympathy especially as Marafa has portrayed the pathetic life style of some victims of that plane crash. He has promised to publish in the days ahead money that was squandered to put CRTV on the satellite. If the regime is panicky it is because they do not know exactly how far Marafa can go with his letters and the effect such letters will have on public opinion. And while the regime is trembling to the point of transferring Marafa to SED where it is expected he will no longer be able to publish other letters, Marafa’s supporters are enjoying the game, as Marafa is putting a regime he serve to task. When will members of the regime stop playing the Ostrich? Monono Humphrey, the Registrar of the GCE Board, Iya Mohamed, the Director of SODECOTTON and Bruno Ebe, Rector of the Douala University have been called up for questioning by the Budget and Disciplinary Committee of the Supreme State Control. The three personalities are called up to response to management irregularities recorded by control teams on the funds allocated to their care from state coffers. Your Excellency, let’s know a little about the mining potentials of Cameroon. Dr. Fuh Calistus Gentry: Cameroon is sitting at the centre of a huge iron ore belt, within the Central African sub region; deposits in Gabon, Benin, Congo and then deposits lined-up from Mbalam right to the coast in Kribi. In fact, iron ore deposits are being investigated even in the North West region. Let me indicate there that the industrialization process in America is centred around the Great Lakes: (belts where the iron and steel industry is developed). So this is a new phenomenon, which is striving everyone out here. Today, the Chinese are almost buying out the Australians, a comity we had the concertion initially, were almost a monopoly in this domain. It is a phenomenon that is attracting the world to Cameroon, not withstanding the fact that we also have some key world class deposits, like the nickel-copper deposits, uranium, diamonds, etc. This has made us a place where everybody thinks he is missing out something which is not here. Dr. Fuh Calistus Gentry: We are not really reinventing the will. Mining starts with the small people taking up licenses, doing what they can; inviting bigger people to come-in. presently we have slightly over 160 exploration licenses. Most of these belong to Cameroonians. But most of them are dormant because they do not have requisite capital to carry out exploration. Ventures like the ones I move along with many mining companies are meant to bring investors to get involved in what Cameroonians have initiated. If I say the Mbalam project is worth $5 billion: this is not the kind of ventures Cameroonians would get into. But the artisan industry is robust in the East which is entirely a domain where Cameroonians are working with an outfit known as CAPAM. But wherever in the world, the small players always start the game and somewhere along the line, the bigger boys get in. This is just what is happening here. Let’s compare the mining and forestry sectors: with the forestry, there is a percentage to do here in Cameroon and another percentage out. Does this apply same with the mining sector? Dr. Fuh Calistus Gentry: I have played a very active role to revise the mining code recently. In this new revision, we have a sloth in which 15% must be transformed locally (for example for 35 million tones of iron produced in one mine in a year, the new code demands that 15% must be transformed locally). We are not ending there. We have taken initiatives where recently, the Korean company by the name ‘POSCO’ one of the largest iron and steel industrial concerns in the world signed a memorandum of undertaking with us. We are also developing a project known as ‘FECUNA’. Iron in the scientific name is ‘Ferus, cobalt, nickel, aluminum, whereby we want to design projects and see how we will get the local sector to start preparing for what is going to be a big industrial uphill in Cameroon. One would have expected that with all these projects coming up, the government should have had at least a project to create an iron and steel industry to process much of the iron. Is that very far or can we already start thinking that we may one day have an iron and steel industry in Cameroon? Dr. Fuh Calistus Gentry: We have signed a memorandum of understanding with POSCO of Korea. The real terms of this memorandum of understanding is to lay down the framework for developing an iron and steel industry in Cameroon. I also talked to you about the FECUNA project, which is going to see much about involving local people in how iron ore, 15% according to the new law, has to be transformed locally. On that front, we are doing a lot and will continue working with other big iron and steel concerns in the world, to lay the foundation of this transformation. One major problem which we are more likely to face is that some of these big companies might come, almost all of their staff, given that in Cameroon we don’t have the trained manpower in mineral exploitation. What has your ministry been doing in terms of training the people who can occupy good positions in the big companies that are coming? Dr. Fuh Calistus Gentry: A mining school in the University of Ngaoundere has just gone operational. In the recent forum, we involved people from the science department in the University of Yaounde. We do encourage the universities in Cameroon to put the mining subjects strongly in their curricular. But notwithstanding, the ministry is aware of this problem; reason why we had a very big chunk in the recruitment of 25.000. We are overhauling our staff and training them so that those who are facing out will liaise with those who are coming new. Despite that there will always be need for some kind of expertise. Our mining code and mining conventions also regulates the quota that must be allocated to local employees. Cameroon possesses these diversed mineral resources in large quantity but it is just now that many people are hearing about minerals in Cameroon. What was the problem? Dr. Fuh Calistus Gentry: Things as you have just seen round the forum; we have traveled round the world telling people: Cameroon is a very stable nation; that it has a very strong energy policy; with a sound mining code which gives a lot of incentives to investors. An agglomeration of these factors has influenced most people to take a risk with us. And in the mine industry, once people come and make noise, this is like ringing a bell for other people to follow. Recently, we had some members of parliament (MPs) raising concerns about the award of exploration and exploitation permits in forest reserve. What are you doing about that? Dr. Fuh Calistus Gentry: When you are awarded a mining exploration permit (license), it can cover 1000km2. A forest reserve might be inside or might interfere with the forest reserve. It doesn’t mean we mark out a forest reserve entirely. Even at the initial stage, it doesn’t pose much problems because exploration is an art. You don’t go digging and clearing the forest. You do small digging, clearing, small drilling; take samples, which in its initial stages do not per se have any impact in the forest. The danger comes when you might find a big deposit, which may be sitting in this forest. At such a time, it is about priorities. If we have a deposit which is going to be the largest gold deposit in the world inside the forest reserve, it becomes an issue to be discussed as a national priority. But so far, we have not had such cases. I don’t think we really go out to give licenses in a forest area per se. Sometimes the forest areas are part of the licensed area. Some months ago there was this controversy over the actual quantity of diamond reserves that we have in Cameroon. Can you give us a clearer idea on this? Dr. Fuh Calistus Gentry: There is a rate at which we are set about exploration in Cameroon: companies do exploration and they tell us what they find. Even in iron ore, we are planning to develop a kind of investigative procedure, where, when there is drill core, the company would analyze half and it is expected that they would give us a quantity, where we can do random checks and verifications of what they find. But the case of diamond is peculiar and particular because it has an erratic occurrence. Now, this particular company found diamond in two environments: alluvia (which is surface) and conglomerate (which projects down to even depths of 500m and above). They did an evaluation and in giving them the mining license, we made it very clear that they have to initially start mining in the surface part and had an obligation to spend at least 2.5 million dollars to concretize the reserves in the conglomerate part. They are moving well with their project. To say exact, we have given them time to make exact the figures. But they gave us a production schedule for over 25 years. Our concern now is to see that their production schedule is respected. The license however made it very clear that they had to over a given period of time, come out with a clearer definition of the size of this deposit. The mining industries are already coming in their great numbers. What guideline has government put in place to make sure that the surrounding population actually benefits enormously from what would be carried out? Dr. Fuh Calistus Gentry: You can look at it from what the law says. There are royalties which are negotiated in the mining convention and regulated by the mining code, which have to do directly with the area, where this deposit or mining activities are taking place. On the other hand, the mining process is huge. If we say there is going to be a railway line of 500km, which is going to, in the final run, handle deposits from Congo, Gabon, in fact, the impact is huge: it is beyond our imagination. It takes $2 billion to build the railway. Just the earthwork alone is over 700 billion FCFA. So these are industries with a very huge impact; that touch people in terms of jobs. Even the net effects of their activity cannot go unnoticed. We have a Ministry of Environment which is a watchdog to see that the activities are done within the tenets of preserving our environment. If a mineral activity is not justifiable, that its impact economically is not that which is worth disturbing the lives of people, we don’t go ahead with it; reason why sometimes, we talk of an environmental impact. This liaises with what the economic impact of this deposit would have on the people. So when one outweighs the other, certainly we find that it would better the lives of the people in that immediate environment and most important, the live of everybody in this nation. You talked about minerals including diamond. Now, for Cameroon to sell diamond on the international market, she needs to be part of the ‘Kimberly Process’. Where are we, in terms of this process? Dr. Fuh Calistus Gentry: We have gone through the process: we have attended the initial meetings in Kinshasa. This ministry headed a mission to Washington. Here our files for adhesion to the Kimberly process will be completed. If not, certainly sometimes this year, we should finally be in the Kimberly process. We know how much the oil sector pumps into the state budget of Cameroon. Is it possible to know what contribution the mining sector would also pump into this national budget? Dr. Fuh Calistus Gentry: We are sizing up what we have; signing conventions to develop. Conventions mean asking and negotiating what taxes and royalties would be paid. This is a stage of evaluation. We have a whole set of rules, which I will refer you to our mining code, which states what corporate tax every company would pay; what kind of concessions you give as a tax holiday; companies invest huge amounts of money. If you were to invest $5 billion to get something going, you can imagine. Most of the moneys are invested during exploration. Given a period, if you don’t pay, that money is deducted from your taxation scheme. So these are a whole range of things that are negotiated during a mining convention. In the Mbalam convention that was finalized, there are guiding principles in terms of taxation. Unless a convention is completed, we cannot say exactly because we have to evaluate the amount of money the company put in exploration; deduct part of this expensive, so that it has a kind of tax holiday period in which to recuperate economically. Prof. Theodosia McMoli, Dean of the faculty of Medicine at the Cameroon Christian University was found dead in her house at the Ntamulung Presbyterian Church premise. Police stormed her residence last Tuesday June 5, 2012 and break into her house just to discover she was tied and wrapped in her own bed-sheet. Her death has shocked the entire PCC family yet the prime suspect whose name we got as Seydou (Sule) is still hunted by police. As police in Bamenda launched a manhunt for the prime suspect, we gathered that the prime suspect was Prof. Theodosia McMoli's driver. Information gathered indicates that Prof. Theodosia attended a meeting at the main Campus of the Christian University at Bali. She returned not transported by her driver. But the driver was spotted sources say with Prof. Theodosia's car (mark Toyota tercel) driving off the church center with one other, after she had returned from the meeting in Bali. Yet no one could suspect what might have transpired. Ever since Seydou was spotted driving out, he had since not returned with the car. Yet police search goes on for his where about. Sources hinted that the next day, she was not available to continue the meeting. Suspicion reached it peak when her phone could be reached, car not seen as well as the driver. The Eye gathered University officials contacted the police. When policemen finally stormed her residence, and with the authorization from the state counsel, they ordered that the window be broken into. This was when policemen found her dead on her bed. Her legs and hands were tied before being wrapped in her bedsheet and placed on her bed. Police and medical doctors are said to have examined her remains before she was taken to the mortuary as investigations ensued. It should be noted that Prof. Theodosa retired from the University of Buea to become the Dean of the faculty of Medicine of the Cameroon Christian University owned by the PCC. Her dead has added to the ongoing legal battle as to who assassinated Rev. Kenji, Pastor of the PCC. 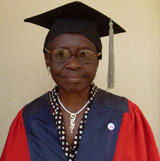 Pioneer Director of the Higher Institute of Health Sciences, Cameroon Christian University, Bali. Yes, Professor Theodosia Eyong McMoli blazed a trail for young men and women alike to follow, yet she was so unassuming and even self-effacing. If she walked down the street you could pass her by without a second thought. Her humble disposition amongst ordinary people never betrayed that she was one of those whose exceptional achievements placed her squarely in the Cameroon pantheon of academic fame with the likes of Late Prof. Victor Anomah Ngu. Born on June 15, 1938, she was the first of five children of the legendary headmaster of the 30’s and 40’s, Mr. Mathias Ebot Ojongtambia and Princess Susana Ebai-Nso of the Oben royal family of Mamfe Town. She definitely set the pace for her siblings Mrs. Jedida Zumafor, Mrs. Faustina Yembe, Mr. Jasper Ojongtambia and Mr. Cyril Ojongtambia. In 1954, Aunty Theo or Sister Theo, as she was fondly called enrolled in Queens College, Ede, Southern Nigeria, an elite all girls secondary school founded in 1952 to honor Queen Elizabeth II’s ascension to the throne. At this time there were no secondary education avenues for women in Cameroon. She later enrolled at the University of Ibadan to study medicine. This was a formidable feat given the limited opportunities. Consequently, when she graduated as a medical doctor in 1967, she inscribed her name in the academic hall of fame in multiple categories. She went on to England where she earned a Doctor of Ophthalmology from the London School of Physicians in 1972 and became a Fellow of the Royal College of Surgeons (FRCS), Edinburgh in 1976. After working in England and enduring the challenges of a young African doctor working in a predominantly white environment, she returned to Nigeria in 1978 taking up employment at the Lagos University College of Medicine as lecturer Grade I. Here, she showed her academic prowess once again, rising to the top of her profession as Consultant/Associate Professor. She was also inducted as a fellow of the West African College of Surgeons (FWACS), and Fellow of the Nigerian Medical Council (FNMC). It is also in Nigeria where she met her husband, a fellow Cameroonian Mr. Lucas Mokongo McMoli with whom she has two children, Malafa and Ojong. The McMoli’s returned to Cameroon in 1986 and Prof. McMoli was employed as head of Ophthalmology at the Yaoundé University Teaching Hospital popularly known by its French acronym C.U.S.S until 1993 when she again blazed the trail to become the founding Dean of the Faculty of Health Sciences in the newly opened University of Buea. While at the University of Buea she rose to the rank of full professor. In 2004, after 11 years of meritorious groundbreaking service at the university, she retired from the Cameroon civil service. Even in retirement she continued to share her vast medical knowledge with the Cameroon community. As an ardent Christian of the Presbyterian Church, she was not only on the board of Presbyterian health services; she became a doctor at the Presbyterian Health Center in Bafoussam. With the intention of tapping into her vast experience and immediate knowledge of setting up a faculty of health sciences, she was appointed as the pioneer Director of the Higher Institute of Medicine and Biomedical Sciences of the newly established Cameroon Christian University. It is in this position that she met her untimely death inside her own house under circumstances still under investigation. Rev. Wara Che, Rev. Tokabo Divine and Rev. Adose Osage have been cited as those who have been unable to pulsate their calling. However, according to information gathered the sanctions were dished out in Kumba recently during the graduation ceremony of some 24 students from the PCC Theological Seminary. According to sources from June 4, 2012 the former Bafoukom church pastor will no more operate as a PCC pastor. He has been noted for his healing crusades at the Bafoukom PC in the neighborhood of Bamenda. The same ax according to classified sources also fell on Rev. Tokabo Divine while on the other hand; Rev. Adose Osage was fined to pay back into PCC coffers the sum of 10 million FCFA. However, Rev. Wara recently staged a spectacular comeback under a different canopy and not the PCC. This was at the Bamenda Congress Hall last Sunday 10, 2012, where Rev. Wara and supporters communed together. In recent years, there had been an outcry for the creation of new administrative units. Sources say if not of the fact that Municipal and Legislative elections have been postponed; new administrative units would have been created. According to the hint, Kumbo would likely be transformed into a City Council with the creation of the Mve, Kimbo and Tatum council areas. Besides, Bui would be split into two. A new Division comprising of Bum, Misaje, Noni and Oku would be created code named “Kimbi Division”. In Donga Mantung Diviwsion, Taku maybe transformed into a sub Division and the villages of Wat, Mbot, Nwangri, Mbaah and Kup carved out to be part of the Taku sub Division, a decision which is raising a lot of anger among the Mbum people. More so, it is also alleged that Nwa will be transformed into a full flesh Division while another sub division would be created in Binka which will absorb part of Mbot. Sources say the move has already been fine-tuned waiting for the Presidential Decree to concretize it. Yet, observers are of the opinion that the creation of the Far North West Region with the same administrative units will be more cherished by the population than the mushroom administrative units. However, no justifications for such plans have been made yet some politicians say it is the handiwork of PM Yang Philemon. Yet, Oku according to the last census results is the largest council area in the Northwest Region and it would be unjust to move part of Donga Mantung Division, which many see as a plan to destroy the long dream of Hon. Tamfu for the creation of the Savannah Region. According information gathered, the creation of the Kimbi Division compassing of Misaje, Noni and Bum would have boosted the creation of the Far North Region and not as what has been proposed by Bui Elite politicians to absorb Misaje and Bum into no-man’s land. As Municipals and Legislative elections may likely take place next year, the struggles as to who will head the SDF electoral districts have been fine-tuned. And with the Social Democratic Front-SDF National Convention billed for October this year in Bamenda, the electoral districts are being organized. The intrigues have been many and many irregularities have been registered. Those who are aspiring to be mayors and MPs were spotted sponsoring candidates to protect their interest. Those who thought they could test their popularity also tried to maneuver to check their capabilities. In some places, elections have been postponed more than twice, but the case of Bamenda II has been outstanding. The drama that took place in Bamenda II has left observers wondering whether the SDF could continue to preach lessons of transparency in elections. What transpired in Bamenda II was that Garba Oumarou, former district chairman was challenged by many, yet the rigging machinery could not succeed. It is alleged money had to change hands in public for massive rigging to take place. Some SDF militants are said to have voted more than four times, but at the end of the exercise, the results could not be proclaimed. It is aired that the ballot boxes were transported to Ntarinkon, where a crowd of angry militants stormed Fru Ndi’s residence. Seeming, Fru Ndi’s hand too were tied. Sources however hinted that the results will be proclaimed by the National Executive Committee. Information reaching us indicates that Mbengwi, Bafut, Tubah, Nkambe, Fonfuka and Bamenda I the intrigues and fraud were the same, yet, Fru Ndi has been mute over the irregularities. They were also fined each to pay FCFA 2 million to the Treasury. The first was convicted of paying premiums and special benefits to public officials and employees without justification, no respect for resolution of the Board, staff recruitment in violation of procedures. Mr. Ndoudoumou also appointed officials of the ARMP in violation of procedures, and hired a consultant paid by the state of which he is responsible. The second, meanwhile, is accused of multiple violations related to public procurement and payment of benefits. The CDBF the CONSUPE is one of the anti corruption arm of government in the fight against mismanagement of public funds and property. Placed directly under the Presidency of the Republic to which it addresses its reports, it has, in recent months, pinned and sentenced to heavy fines half a dozen senior officials. When Issa Tchiroma Bakary was appointed Minister of Transport by the Head of State, Paul Biya, on November 27,1992, he (Tchiroma) decided to withdraw the aircraft maintenance contract of the national airline, Cameroon Airlines (Camair) from Air France to the benefit of the South African company, South African Airways (SAA). At the time, the Cameroonian public exults address this seeming return to Africa.In fact, the transaction has little patriotic motivation.We'll know more later with some problematic content of the contract. "The so-called Maintenance Contract with the South African company was poorly done," then repeat inaudible, reasons why wondered why CAMAIR technicians wondered why government could not choose to invest locally. There are minor incidents that one is silent. But the climax turns out to be the tragic crash of B. 737 called "The Nyong" which resulted in the death of 71 passengers in December 1995.At the time, the investigation quickly concluded a "pilot error" a former pilot of the Air Force, Commander Yunusa, who was hastily recruited to Camair due to his proximity to the Minister of Transport, Mr Issa Tchiroma. A Lebanese law firm, Advanced Trust, owned by a certain Prof. Fouad Srouji, will provide, later, to the Cameroon government documents showing evidence of Cameroonian officials who were corrupted by the South Africans for the transfer of maintenance aircraft contract to the South African company. Some would have even acquired real estate in the land of Nelson Mandela. Issa Tchiroma by then was the chairman of the commission to privatize airports in the country which many people continue to suspect faulty bargains and procedures if it had reached apex level. Enters Advanced TrustThe State of Cameroon through his advice that the legal affairs adviser Jean Fouman Akame, and the lawyer, Georges Engono Essame, and get successful and damages (billions of CFA francs) to the South African courts in a lawsuit it brought on behalf of the State. A memorandum of understanding with the French-Lebanese firm had used to purchase evidence of mafia deal.In addition to the Minister of Transport, Issa Tchiroma, the deal also involved the former commercial director of Camair, Louis-Paul Motaze, and former Chairman of the Board, Mr. Joseph Belibi. The trio carries technically responsible for the tragedy of B. 737 "The Nyong. "Under the guidance of Special legal adviser to the head of state, John Foumane Akame, the Mfoundi Court had shown interest to take charge of the precarious situation . The State Counsel Mvondo Evezo writing to the Head of State had expressed the desire to set a public action against the three corrupt. Especially as Cameroon Airlines just lost Boeing 747 "Mount Cameroon" in the Parisian sky which was just back from South Africa after checkups. Yet, nothing took place after because President Biya who was contacted had not reacted. The unit was returning from a technical visit to South Africa. Nothing has happened since.The only reaction was the reappointment of Issa Tchiroma in 2009 as Minister of Communication as well as the continues appointments of his "nephew" Motaze in various posts of responsibilities. Hon. Joseph Mbah Ndam SDF MP and one of the Vice Presidents at the National Assembly has tabled a motion to Hon. Cavaye Yeguie, the President of the National Assembly requesting for MPs to investigate into some information leaked in Marafa's third letter commonly known as MARALEAKS. SDF MPs are requesting on the National Assembly to set up a parliamentary commission of inquiry, on the non-compensation of victims of the crash of the Boeing 737-200 in Douala in 1995. This request is based on some excerpts from the open letter of Marafa Hamidou Yaya, former Minister of State, Minister of Territorial Administration and Decentralization. Marafa in his open letter raised emotions that when the accident took place he "proposed at the time, to the President of the Republic that the 71 victims be compensated with a sum of 100 million FCFA each.Whereas a sum of 25 billion FCFA supposed to have been paid into the accounts of CAMAIR ended in private pockets. But "until now, none of the victims have been compensated, nor the sum of 25 billion CFA francs plus damages to be paid to. Yet, the deceased including his employees were never paid their rights. To the SDF A parliamentary inquiry to verify this information and establish responsibility for compensating the families of seventy-one victims of Boeing 737-200 would come to past. 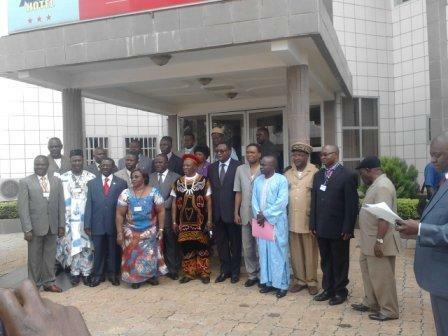 SDF MPs based their approach on the Constitution of the Republic of Cameroon. It "provides in Articles 14 (2), 29 and 351st control Government action through, inter alliance, the formation of parliamentary committees of inquiry on specific objects." They also rely on standing orders "Regulation" of the Assembly (amended by Law No. 93/001 of 16 June 1993) in Article 67, together with Law No. 91/029 of 16 December 1991 which specifies the procedure in the matter ". It's been 17 years since the crash of the Boeing 737-200 (Nyong) occurred, causing 71 victims. Yet the legal proceedings against the company Transnet South African Airways (SAA, Transnet), had resulted in the payment of the $ 32 billion CFA francs, after that company was convicted and Cameroon compensated. Sparrow Hawk, Two CPDM Mayors Arrested?